Funny Facebook Comments: Hilarity of the Week! Welcome to another round of Hilarity of the Week! 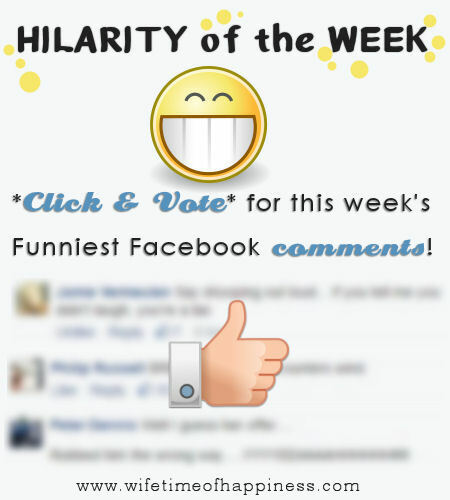 Come on in and cast your vote for this week's favorite funny comment! This entry was posted in Fun & Games, Hilarity of the Week and tagged facebook funnies, funny comments on facebook, funny comments online, funny facebook comments, funny people on facebook, hilarity of the week, hilarity of the week mrs white, mrs white, mrs white funny facebook comments. This entry was posted in Fun & Games, Hilarity of the Week and tagged funny comments, funny comments january, funny comments on facebook, funny facebook, funny facebook comments, funny people on facebook, funny voting poll, hilarity of the week, hilarity of the week mrs white, hilarity of the week wifetime, mrs white hilarity of the week, ridiculous comments on facebook, voting.